Old San Juan is a window into the Puerto Rican culture and its origins. The Spanish influence is vivid, and embedded into the structures, the colors, the food, and the music. Even the cobble stone streets, the fort, and the ruins are a reminder of the Spanish colonization of the island. On November 19, 1493 Puerto Rico was discovered by Christopher Columbus on his second voyage to claim lands for the rulers of Spain, King Ferdinand and Queen Isabella. In 1493 the island was called Borinquen by the Indians, who lived there; the Tainos. Columbus named the island, San Juan Bautista. Later, Spanish traders began calling the island Puerto Rico, which means “rich port”, and that name stuck until today. One of the men who landed in Puerto Rico with Columbus, was Juan Ponce de Leon. History tells that he was looking for the Fountain of Youth. In 1508, he founded the first Spanish settlement colony in Puerto Rico at a spot near where old San Juan is now located. The ruins are still preserved there. 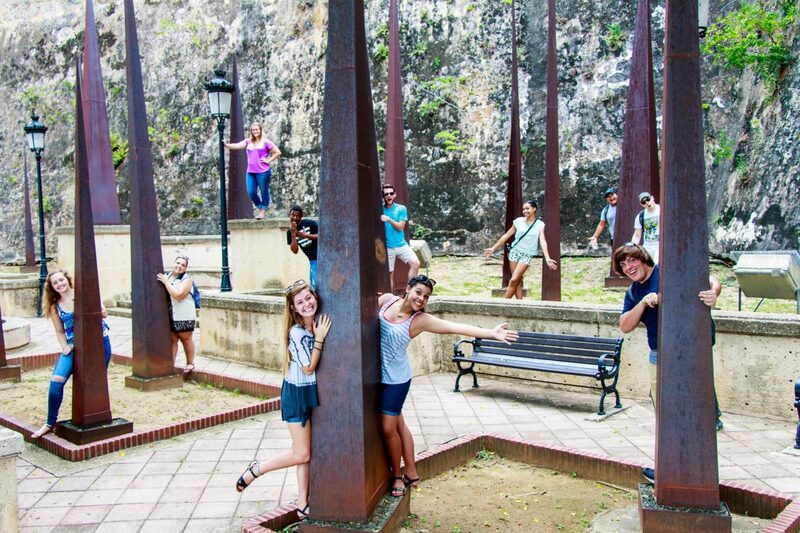 On Tuesday, September 20th, the colleagues were able to enjoy a visit to Old San Juan, on a typically hot day. A visit to Old San Juan is a must for anyone who comes to Puerto Rico, whether for vacation or business purposes. The colleagues made several stops on their tour of the old city, starting with calle San Sebastian, famous for the week long festivities that take place on the third week in January, to commemorate the end of the Christmas season. They took a stroll down the Princess’ path, The famous Door to the island, El Morro (the fort), Parque de las Palomas (Pigeon Park), and more. The tour concluded with a stop for island ice cream, to cool from the heat, and refresh the taste buds. Sadly, Ponce de Leon never found the fountain of youth in Puerto Rico, or elsewhere, and although the colleagues are not looking for the fountain of youth, they are, however, looking forward to making deep connections with the locals, and discovering more about the culture.